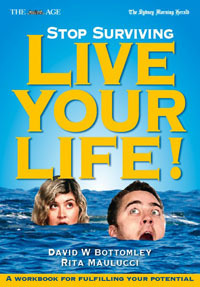 ~ Stop Surviving, Live Your Life! Working, maintaining relationships, running households, worrying about our health and money - it is as if we are all preoccupied with the day-to-day task of running our lives...This book aims to provide you with a guide to moving beyond mere survival and towards a greater sense of potential. The book is divided into 6 key chapters, each with a different question for you to answer about your life. Throughout, there are exercises to help you answer these questions and build a picture of what it is you can realistically do to improve your life in practical, satisfying and fulfilling ways. Plus there is an assessment for you to complete at the beginning and at the end of the book so you can 'see' the shifts you make throughout your journey. This is a workbook designed to challenge you to step outside your comfort zone - where you might live a life of predictability, security and safety but perhaps not of fulfilment, happiness or challenge.